Smithereens: DeNami October Blog Hop!!! i love the embossed leaves!!! awesome card! it makes me so excited for cool weather and fall! The embossed leaves are gorgeous! Love the background paper and of course I love the focal image! Beautiful fall card! SO SO SO SO LOVE this card dearie!!!! This is awesome!!!!! 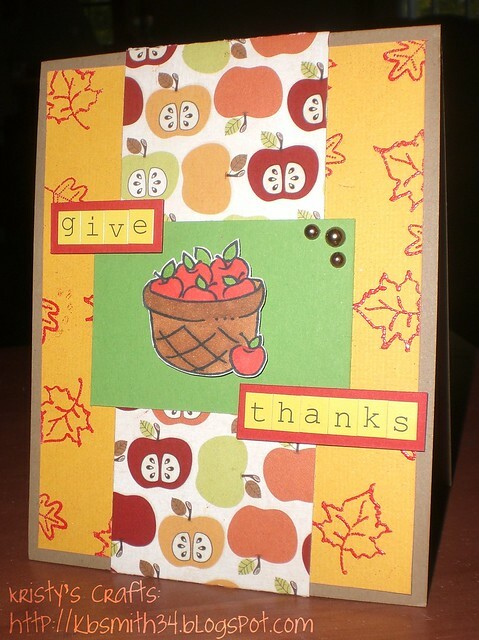 So so cute...thanks for sharing..
beautiful fall card, thanks for sharing! Cute card. So much to look at it but it doesn't feel crowded. TFS. Darling use of DeNami's Apple basket. Your layout is sweet! Love the paper matched with this stamp! Cute card!! I love the fall card. It's my favorite season--the colors, the image, etc. love it! The emobssed leaves are delightful - great card! Those apples look delicious! Cute card! Like how you created the background by stamping and embossing the leaves...very nice. What a great card. That leaf looks awesome embossed with the rust embossing powder. Great background. Thanks for sharing. Nice card. I love the apple paper. Cute display of autumn on your darling card! Beautiful design! I love those apples!! The background paper with the tiny maple leaves is so perfect! TFS!!!! I just LOVE that apple basket, and pairing it with the fabulous apple paper by imaginisce is fabulous! What a fabulous fall card, and I've never seen that DeNami leaf you used in the background. So fun to see how you combine pattern paper and make your own sentiment... great job! Gorgeous card! Love the title letters and background embossed leaves! A very nice card using the great apple basket stamp!! I like the way you used the leaf to make the background. FABULOUS FALL card, Kristy!!! LOVE the embossed leaves, the patterned paper and that AWESOME basket of apples!!!! I like the way you used the leaves for the background. Great job! I love the embossed leaves for a background! Beautiful card! Thanks for sharing! This card is everything that I think of when I hear the word Fall. The way you paired up the leaves and the Apple Basket was really great, Kristy! So happy you were able to join us for this blog hop! Love the embossing on the background and that apple paper is perfect! It goes so well with the Apple Basket stamp. fantastic layout. Love the background you created with the leaf stamp, works well with PP. great color too. Beautiful card ~ your embossing really shines! The embossed leaves really stand out! Great card! Love how you have created your background with the leaves and the colors! Wonderful card.